The guard brings the ball down the court and pauses at the three-point line. Everyone else goes to a 4 stack low position. 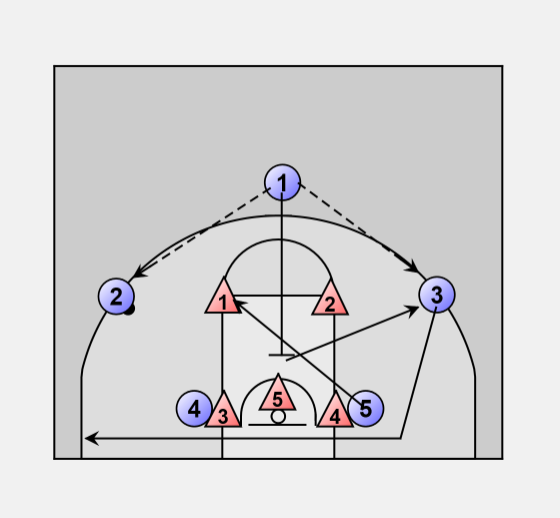 On the break the 2 & 3 roll to the basket and then back underneath the pick from 4 & 5 and spread to the wings. In this example he passes to the 2 guard and breaks to the basket. 1 then sets a pick on the defensive center and 5 breaks behind the pick to the elbow. 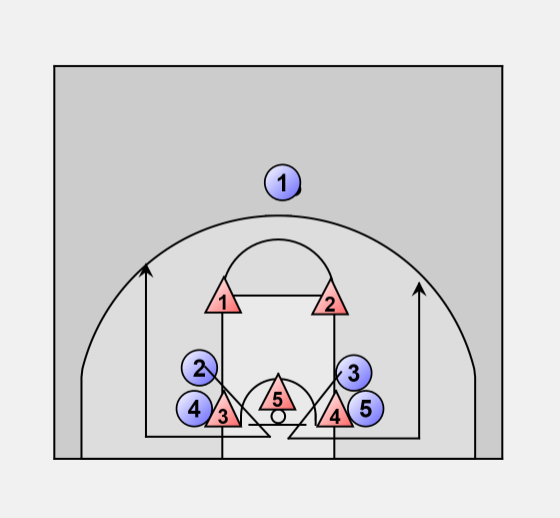 At the same time 3 breaks down and under the basket going all the way out to the opposite corner. After 1 completes his pick he rolls away to the opposite wing. At this point 2 should have four options. If the defense doesn't play out on him he should have a shot. Or he can pass to 5 flashing across the middle, 4 on the block, or 3 on the back cut. Based on the defensive rotation one of these options should be open for a shot. If there was no chance for a shot 4 will break high to receive the pass and reverse the ball. When 4 gets to the top of the three-point line and 2 passes the ball to 4 he will start on a back cut down and under the basket. With 4 passing on around to 1, 5 will drop to the block, 4 will drive the middle behind 5 setting a pick on the center, 3 breaks behind 4 to the elbow. After completing the pick 4 rolls to the opposite wing. We have the same opprotunities as before. 1 has four options, shoot, pass to 3, pass to 5, pass to 2. Based on the rotation of the defense one of these options should have an open shot. If no shot is taken we go through the same process to reverse the ball as 5 will break out high. When 5 gets to the top of the three-point line and 1 passes the ball to 5 he will start on a back cut down and under the basket. With 5 passing on around to 4, 3 will drop to the block, 5 will drive the middle behind 3 setting a pick on the center, 2 breaks behind 5 to the elbow. After completing the pick 5 rolls to the opposite wing. We have the same opportunities as before. 4 has four options, shoot, pass to 2, pass to 3, pass to 1. If there is no shot reverse again and continue the rotation.